The field of orthodontics is a specialized field of study that focuses on correcting misaligned teeth and correction of bite and jaw problems. Orthodontists receive a significant amount of training and expertise post dental school in the study of tooth alignment. Braces are the basis and tool of choice when patients have a need for realigning the teeth. The science of orthodontia has evolved significantly in the last several decades. 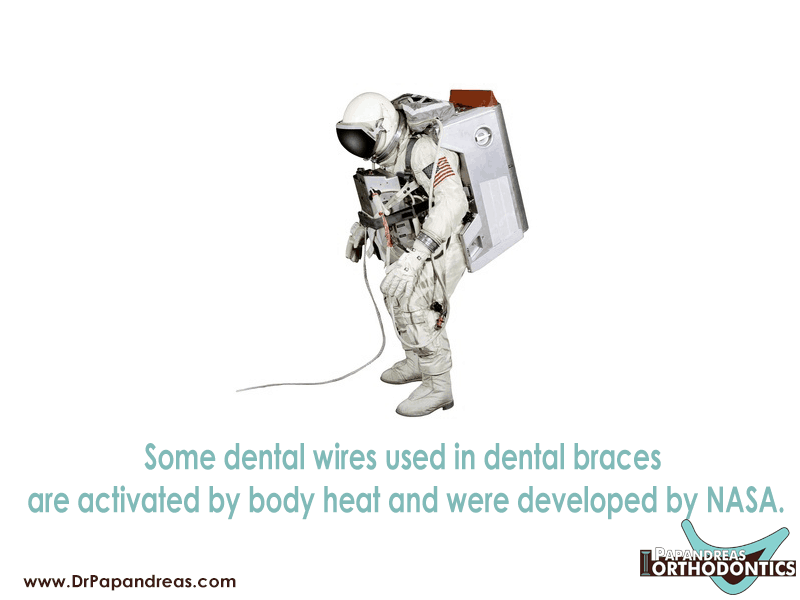 So much so, in fact, that some dental wires, developed by NASA, are used in braces are activated by body heat. This allows for an even more customized fit and execution of correction than even traditional braces can offer. Lingual braces are placed on inside of teeth. They too are unseen by others. Adults and children as young as 7 can benefit from an orthodontic consultation. There have been many technological advances in the field of orthodontics. These include digital imaging and three dimensional x-rays allow for custom fit like never before possible. Some patients may be candidates for accelerated treatment and bracing. https://drpapandreas.com/wp-content/uploads/2016/09/Pap-Fact7-2016.png 600 800 Dr. Sam https://drpapandreas.com/wp-content/uploads/2016/04/logo-dr-papandreas.png Dr. Sam2016-11-03 10:00:002017-05-04 05:28:02Orthodontic Fact #7 Some dental wires used in dental braces are activated by body heat and were developed by NASA.